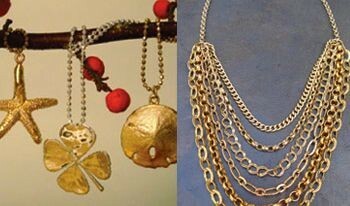 Today from 3 to 8 Julie Schwanbeck of Jules jewelry will be at the Serpico boutique to show her line; pieces can be personalized on the spot. Also, the store is having a summer sale with discounts of up to 60 percent. Tonight Akira holds its first-ever annual men's fashion show, SolarX, featuring clothes from Diesel, Ben Sherman, Bjorn Borg, and others. It's at Moe's Cantina, 3518 N. Clark. Doors open at 5:30 and the runway show gets underway at 7. Dress attire is "strongly suggested"; RSVP to events@akirachicago.com or 312-327-0348. Starting Friday local designer Abigail Glaum-Lathbury holds a sample sale of her unusual clothing, with pieces up to 50 percent off and as cheap as $25&emdash;including items from her new lower-priced line, Elmidae. Also featured: feathery accessories by Haji Couture. It's Friday from 2 to 7 and Saturday from 11 to 6 at Glaum-Lathbury's studio, 1457 N. Wood. On Friday, Kirsten Goede of Objets d'Envy, Kate Boggiano, and stylist Kate McClenaghan team up for Good Glam Gala, a charity fashion show that benefits the Boys & Girls Club of Chicago; $50 gets you a nosh from the Hearty Boys as well as chocolates, wine, and beer.